Staff Sgt. Marc J. Small, 29, died of wounds sustained from enemy fire during a combat reconnaissance patrol. He was a Special Forces Operational Detachment-Alpha team medical sergeant assigned to Company B, 1st Battalion, 3rd Special Forces Group (Airborne). He deployed in support of Operation Enduring Freedom in January 2009 as a member of the Combined Joint Special Operations Task Force – Afghanistan. This was his first deployment in support of the Global War on Terror. 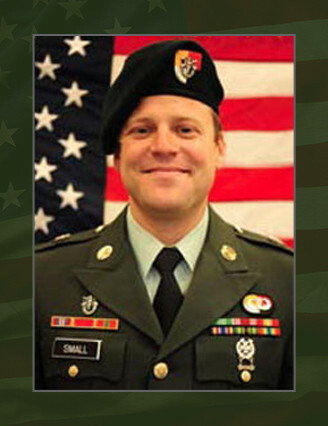 Small, a native of Collegeville, Penn., volunteered for military service and entered the Army in December 2004 as a Special Forces trainee. After basic and advanced individual training at Fort Benning, Ga., he was assigned to the John F. Kennedy Special Warfare Center and School at Fort Bragg, N.C., in May 2005 for Special Forces training. His medical training was with John F. Kennedy Special Warfare Center and School at Joint Special Operation Medical Training Center. He earned the coveted “Green Beret” in 2007 and was assigned to 1st Bn., 3rd SFG(A) at Fort Bragg, N.C., as a Special Forces medical sergeant. Small’s military education includes the Survival, Evasion, Resistance and Escape Course, Sniper Course, Basic Airborne Course, Basic Noncommissioned Officer Course, Warrior Leaders Course, and Special Forces Qualification Course. His awards and decorations include the Army Commendation Medal, Army Achievement Medal, Good Conduct Medal, National Defense Service Medal, Afghanistan Campaign Medal, Global War on Terrorism Service Medal, Noncommissioned Officer Professional Development Ribbon, Army Service Ribbon, Overseas Service Medal, NATO Medal, Parachutist Badge, Combat Infantry Badge and the Special Forces Tab. He was posthumously awarded the Bronze Star Medal, Purple Heart and Meritorious Service Medal. Small is survived by his mother mother and step father Mary and Peter MacFarland of Collegeville, Penn. ; father and stepmother – Murray and Karen Small of Mechanicsburg, Penn. ; his siblings Matt Small, Megan MacFarland, Heather Wellock, Jennifer MacFarland; Travis and Tyler Baney; and his fiancé, Amanda Charney.